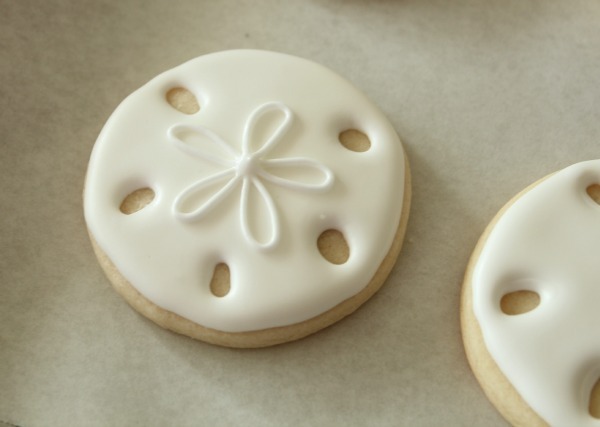 Sand dollar cookies might just be the easiest cookies you’ll ever make. I know, I know. I say that all the time. 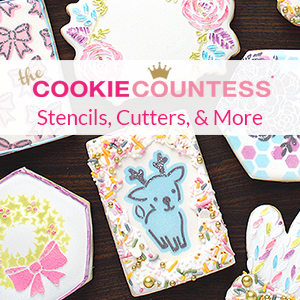 But these cookies require nothing more than a round cutter and a bit of white icing. See what I mean? E-A-S-Y, easy. Anywho, think of this cookie as a clock. 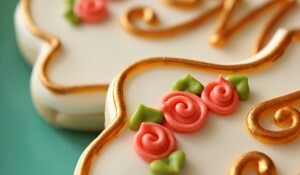 Use 20-second icing to make holes at 11, 1, 4, 6 and 8 o’clock. You must work quickly when applying the base to avoid any noticeable seams. Once that’s done, make a ring around the edge of the cookie then quickly flood it all together. Make sure to make your spaces wide enough so that the have room to spread without running into one another. I got a little tiny seam because I was taking photos as I worked, but this is basically what it should look like. Let the cookie dry completely before moving on. 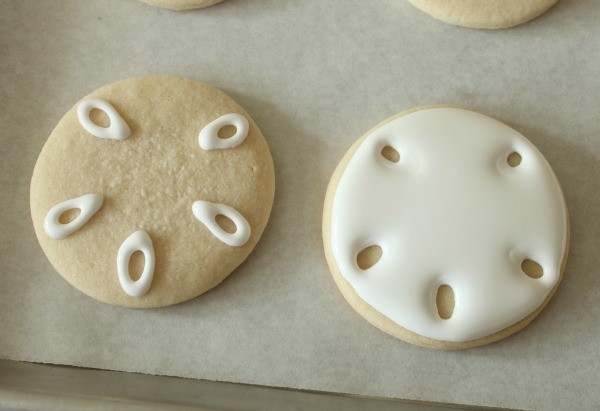 Use a pushpin to mark the center of the cookie before adding the center star. Using the pinhole as a starting point, begin forming loops between each of the openings. There will be five in all. Let the cookie dry. You can stop there and it would be perfectly okay, but I wanted to add a little more pizazz to my sand dollar. I added a few tiny dots above each loop and then gave it a little mist of pearl sheen with my airbrush. The shimmer is subtle, but it really adds a lot. 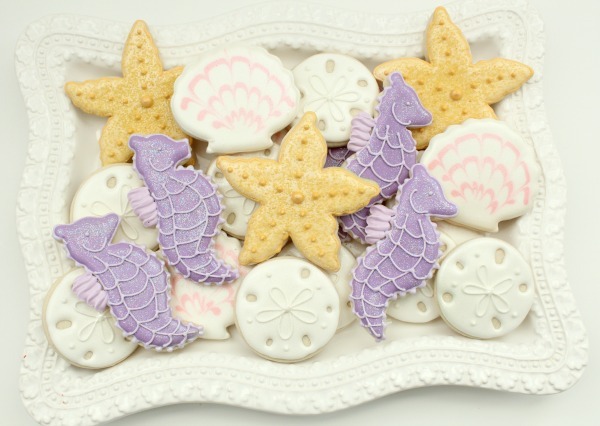 These cookies can stand on their ow but they also look great mixed with pretty seashell, seahorse, and starfish cookies. If you really want to get creative try laying them out on a bed of raw sugar, which looks like sand. It really makes for a beautiful presentation. I don’t often say TGIF, but seriously…than GOODNESS it’s Friday. I hope everyone has a safe and happy weekend! This is CRAZY timely. 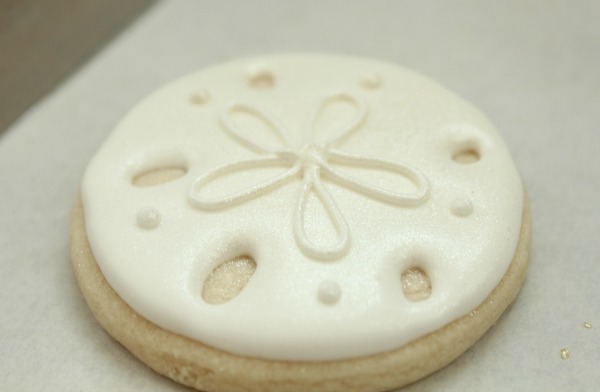 I have sand dollar cookies all baked and ready to decorate this morning! I put holes in mine with a straw before I baked them. well shoot…I am making my mom cookies for my trip to visit her at the beach, and I had them all planed out. And then I see these, so simple and elegant, and they would be a nice one to mix in with the others for her get together….shoot shoot shoot…I have 2 dozen fluted circles…I will have to rethink everything this weekend! They are gorgeous, you are a great inspiration! 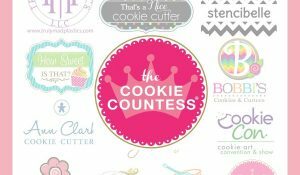 Escribo desde España Andalucia, estoy comenzando a hacer cookies y tu blog es lo mejor que me ha podido pasar para aprender, es genial como se aprende viendo tus imágenes. 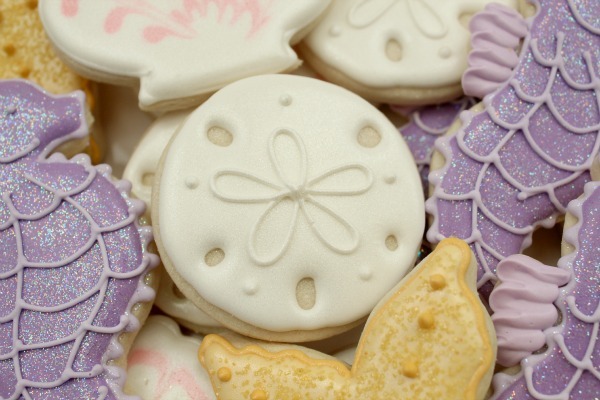 These are so incredibly pretty on their own but they look so freaking amazing mixed in with the other beach themed cookies. I’ve never seen a sand dollar in the flesh only photos from online would you believe? Maybe because I live in England though, hehe! I just love these – they are so beautiful in all their simplicity. These are simply elegant. So beautiful. 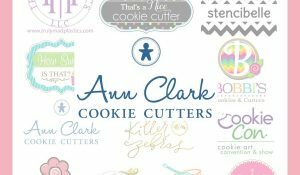 What kind of airbrush system do you use? These are GREAT!!!! I want to create a beach/summer themed basket for the kids to surprise them while on vacation this year!!!!! 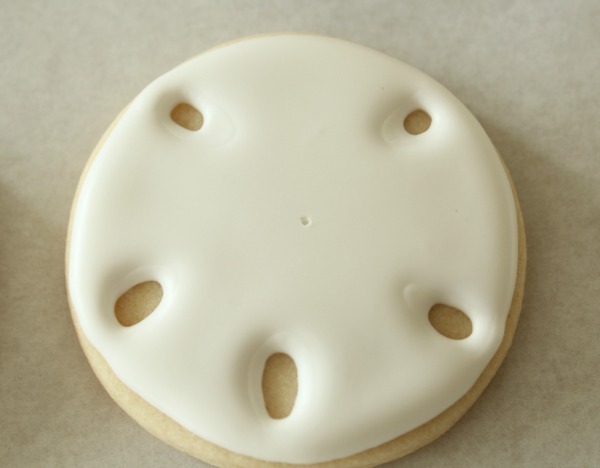 I’m thrilled to see the instructions for your lovely sand dollar cookies! I’ve been eyeing them since you first posted your nautical themed treats. If it weren’t 100 degrees outside today, I would bake these today. Thanks for the great, easy tutorial! I just love your site. Can I brush on glitter dust for a similar sparkled effect? 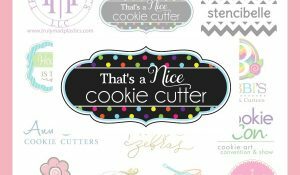 I’ve said it before, but i’ll say it again 🙂 This is probably my favorite batch of your cookies! I’m a gal who loves her glitter! We bought today some sand dollars for Tiffany to play with but your sand dollar cookies look so much better and they are edible! What’s not to love?! Oh, I just love all of these! So gorgeous.